Golden Retriever training may seem daunting now that you have a rambunctious pup; don’t despair. This guide has the best golden retriever puppy training tips, step-by-step exercises and so much information you will feel like an expert very soon. From potty training to obedience, you won’t have time to get bored. The golden retriever dog is among the 10 most popular and intelligent dog breeds. They are handsome and charming; with the right amount of training, exercise and social interaction they can become friendly, playful and very social dogs. It is no wonder then, that they are a favorite breed as pet companions, guide dogs for the blind, therapy dogs, drug sniffing and search and rescue, among others. Training a golden retriever requires a little bit of patience, a variety of treats and toys, and a fun attitude. So, gather those up and let’s get started. If you haven’t adopted your golden retriever puppy yet, please know that you should only get your new dog after he/she is 7-8 weeks old. Studies have shown that separating a puppy from mom and siblings before that time may lead to behavior problems later on. 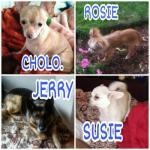 This may seem obvious but potty training problems are one of the main reasons dogs are surrendered at shelters. The most important concept you need to understand is that puppies can’t hold their bladders too long, so you will need to be attentive until puppy “gets it”. 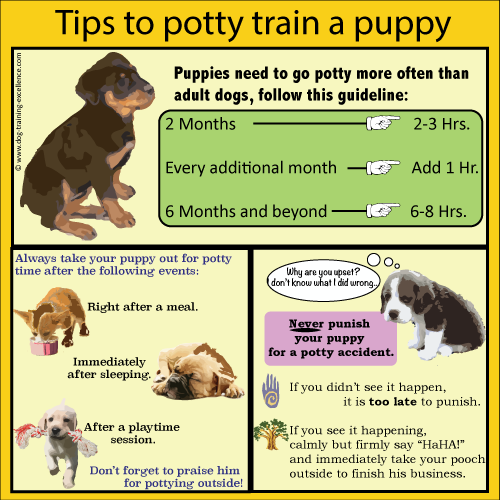 This link will take you to a step-by-step guide on potty training and crate training a golden retriever puppy. 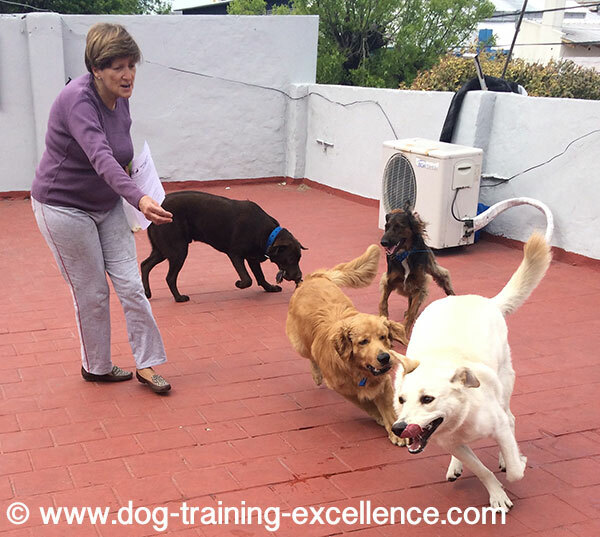 As a dog trainer I get asked many questions about dog behavior and training. One of the most popular things my clients say is “I want a friendly and social dog”. My answer - SOCIALIZE YOUR PUPPY! In this photo Samsom is being socialized to babies and also to people putting their hands in his food bowl. Always add something yummy! Many scientific studies have shown that puppies have a developmental period called “the socialization period”. During this time it is especially important that a puppy has POSITIVE interactions with everything he/she will encounter as an adult. Unfortunately, this period is very short and closes at 3 months of age. This means you have about 4 weeks to socialize your puppy to people of all sizes, genders, colors, ages, with costumes, hats, umbrellas; dogs of all sizes, colors, ages; cars, buses, trucks, loud noises, water, hair trimming, nail trimming, etc. 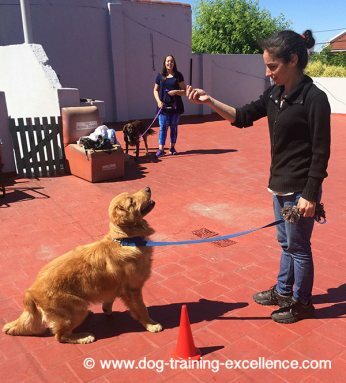 Take your pup to a golden retriever training and socialization class that uses only positive methods. The first four weeks with your new golden retriever pup should be the busiest ones, follow this link for a detailed list and guide on how to socialize your new baby dog. Golden Retriever puppies like to play with their mouth and teeth… Ouch! It is natural and completely normal. The bad news is that you CAN NOT stop it, they NEED to bite, you can redirect their bite to appropriate things, like toys. The good news is that you can teach them to control the pressure they make with their mouth until mouthing turns into soft kisses. Follow this link for a how-to-guide. 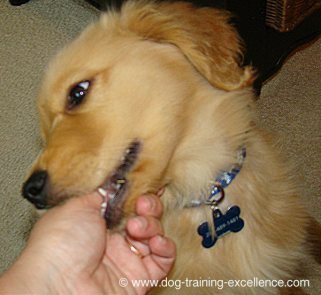 Playing with a puppy's mouth is a great way to teach him to how control his teeth. Yelp! like a puppy in pain to let him know it hurt! 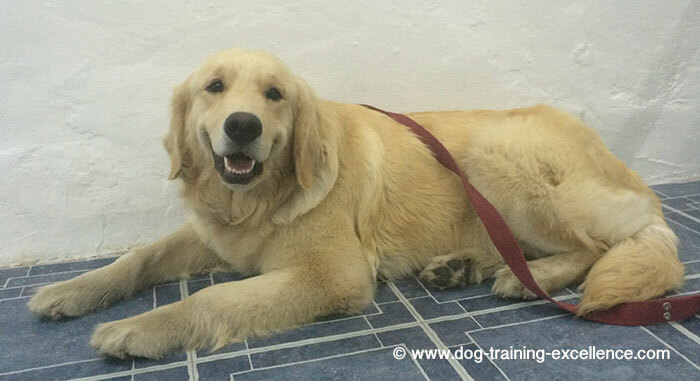 Finally, you can also start golden retriever training obedience commands, since puppies can learn very fast many things but you need to concentrate your attention on the three topics above, because they are key factors to help your puppy become a friendly and social dog, one you can trust and trusts you. 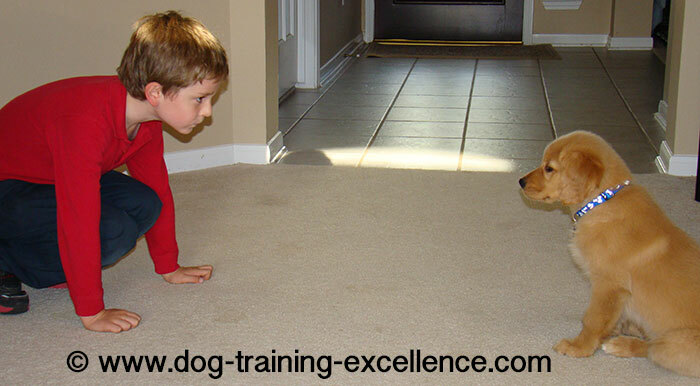 Teaching your kids to train your Golden Retriever puppy is a grat way for them to bond. Sit and stay! If you are calling your adolescent Golden Retriever, keep calling or go get him until he responds. Do not give up. Then repeat 3 more times. You have been training your GR puppy for months, he has become the most well behaved puppy in history…then one day, he just won’t do what you say! This is classic adolescence behavior and may start happening when your golden is between 8-10 months. Just like humans, dogs also have an adolescence period, and just like humans, they like to test boundaries. Take your golden retriever dog to an obedience class that uses positive methods only! Teach your GR it’s name - And find the best names here too! If your dog won’t answer to your command, gently but firmly keep asking until he does. NEVER give up, otherwise they learn that if they ignore you long enough you will stop bothering them. Adolescence is also a period of physiological changes in the dog, you may notice that they will start interacting with other dogs differently. It is important to continue with socialization exercises to keep all interactions positive. 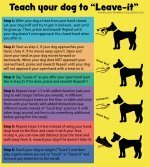 Bring treats with you everywhere and treat your dog for having friendly encounters with other dogs. It may seem like “free treats” to you, but it is not. 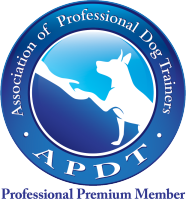 You are building a strong and positive association with other dogs, so your pooch will keep treating them nicely. A well socialized and trained golden retriever is a happy dog! At about 2.5 - 3 years old, Golden Retriever dogs become adults, or as adult as they get! Things should start to settle, and if you spent the first three years socializing and training your dog, you will now enjoy a social, playful yet obedient canine. It may take more time and patience, but dogs of ALL ages can learn. I am telling you this from years of experience, if you practice and follow the instructions many problems can be solved and some of them even very quickly. Golden retriever training is enjoyable at any age. Hope this Golden Retriever training guide has helped you, don’t forget to share your stories with us! 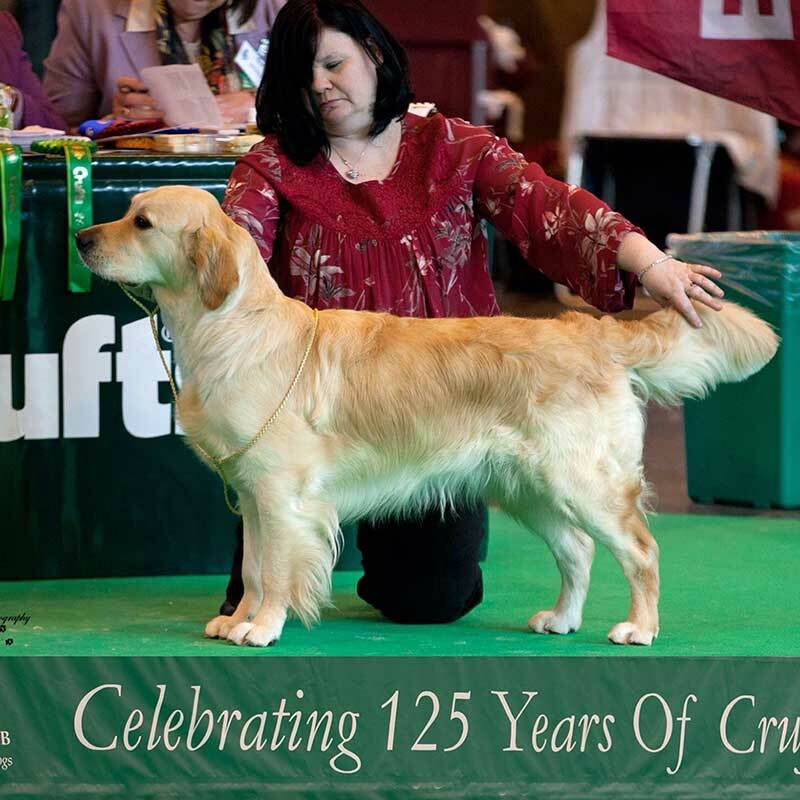 Golden Retriever History: An interview with Chairman of the Golden Retriever Club of Scotland.